It’s with some discomfort, then, that I’ve seen a trend for childish, aggressive, and downright rude behaviour from fellow freelancers – particularly on those job sites we all hate so much. Yes, they encourage bargain-basement rates. No, that doesn’t make your behaviour okay. “Try adding a zero to your budget,” they say. “Professional? Get real.” “Thanks for wasting my time,” I read (which presumably means someone is mourning the loss of the 45 seconds it took to read a ridiculous brief with a subpar budget). We’re throwing our toys out of the pram because things aren’t how we’d prefer them to be. We’re using our creativity to come up with clever ways to put strangers under attack. And we’re not doing our business – or our rates – any favours. I have close friends who don’t really understand what I do, not fully. And when I meet somebody new, I call myself a copywriter and there’s this quiet, mutual understanding that they don’t know what I mean but that’s okay. It’s not like being an electrician, or a plumber, or a professional disco dancer. It’s not a job title that’s in everyone’s vocabulary or neatly self-explanatory. So, in a place designed for small businesses, how do you expect someone to guess what constitutes a fair rate? It’s easy for you because you are one. You know about this business and how it all works. It’s your career. But the rest of the world – and even the small and growing business that may become your best clients – probably don’t know much at all. If they’ve made any attempt to look for a going rate, they’ve probably done a cursory Google. 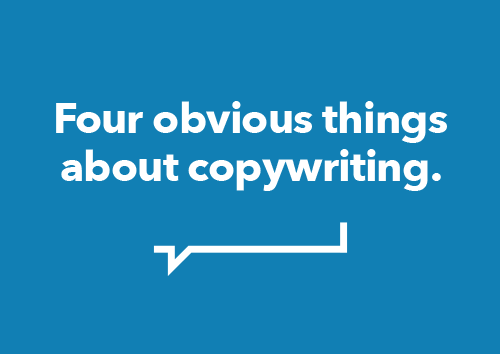 But not for copywriter – just for writer, a term that could cross everything from the space-filling content mill sort of writer to a six-figure expert. Of course, many of the results they’ll find will be from other freelance marketplaces, where the bid culture, global reach and sheer quantity of people inevitably keeps rates low. That’s why, at least sometimes, potential clients don’t know any better. They certainly don’t deserve to be shamed for suggesting a budget that’s unrealistic. If you can’t tell me the going rate for a brain surgeon, a piano tuner and a candlestick maker off the top of your head, don’t treat people so disrespectfully when they don’t know how much you cost. What makes things worse here is that the going rate is really a fluid, ever-changing thing. I’ve been a freelance copywriter for seven years and I couldn’t tell you what it is. I know what I can charge. I have a sense of what other people charge and, thanks to the hard work of groups like the Professional Copywriters’ Network, what some of the best copywriters think is fair. But I wouldn’t call that quite enough to define a uniform, industry-wide rate. With those aspects in mind, I can land at a day rate – something I still give out for the sake of comparison to other copywriters, despite only charging fixed project fees in practice. But the amount of work I get done in a day goes up and down. My day rate can feel incredibly low if I’m having a bad day and much higher if ideas fall into place and copy comes together faster than anticipated. There are times when something would be better than nothing. There are times when it’d take the right price to convince me to add yet another job to my list. My point: we’re all fluid with pricing. It’s a skill that I think is very important for the business side of being freelance. But it makes getting a grip on what constitutes a fair price difficult for me, let alone someone client-side. Maybe your prospect is a little more educated. But you can’t assume they should know better – instead, assume they know what they want. Maybe they understand the wide range of people calling themselves copywriters. And maybe they just want someone to fill the space with words. Not everyone cares about how persuasive it’s going to be or how striking the tone is. Some people don’t expect their customers to take action, they just know they can’t leave blank spaces all over the place. Your potential client could be looking for someone to generate mass, not make a real impact on outcomes. They’re probably wrong. You can probably try to educate them about the value of what you have to offer. But they probably won’t listen. And that’s fine, isn’t it? They can find someone to fill the space at a fraction of your rate. It doesn’t require any of the skills, insights or knowledge you’ve built up over the years. They’ll get what they pay for, sure. But that could be exactly what they want – and exactly what somebody less experienced than you is willing to do. That project isn’t for you. No need to get shirty about it. Of course, not every potential client is the innocent party. There are times for umbrage and outrage. Sometimes people know exactly what they’re doing. They want you to work for less, or they offer rates that don’t even meet the minimum wage. They don’t respect the value you’re bringing to the table. They want to protect their margins, or have you pitch ideas and write samples without any guarantee of paying work. Those people are out there. Those are the ones who deserve your attitude. Unless you’ve got the reputation of someone like Harlan Ellison, you probably need to do that in your head or, worst-case, in a conversation that’s private. I know it’s frustrating. I get it. I don’t like the devaluing of our rates anymore than you do. But that frustration we all feel at times isn’t something to be shared. When you put it out into the public, you’re just damaging the way we’re all perceived – not as respected professionals but as grabby, whining babies. More to the point: when has it ever worked? Has anyone ever thrown a “Shame on you” at a potential client, only for them to realise their mistake and instantly quadruple their budget to suit your rate? There are low-paying clients out there. They’re not for us. They’re for newer freelancers that are trying to build a portfolio. It’s those freelancers that are responsible for the lowering of our rates – but you wouldn’t hold that against them, would you? Like the rest of us, they’re just trying to get by, growing their skills until they can command a higher rate. The so-called professionals devaluing our work by expecting a professional rate while behaving like an amateur?